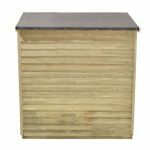 Now all of your gardening equipment, tools and other items that are clogging up the garden and house will have a nice, safe place to call home, thanks to the fantastic Hartwood 6′ x 4′ FSC Pressure Treated Overlap Apex Shed. This is one very well made and impressive looking shed that thanks to its special little window on one of the sides has a very charming personality. 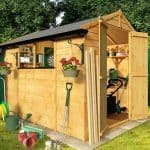 This is a shed that has been designed so that it has a very old school type of look that is going to go great in your garden. The shed also can actually handle quite a lot of items even with its rather compact size. The shed has been made very well so it is not something that is style over substance, far from it. You see this shed has been constructed with wood that has undergone a pressure treatment process to ensure it can handle anything the weather can throw its way. The shed is also very robust thanks to some very clever design which has linked up some very impressive 8 mm thick overlap cladding and a solid frame. This is not just a shed that is here too look pretty it is also going to last you many, many years. The Hartwood 6′ x 4′ FSC Pressure Treated Overlap Apex Shed is a very nice looking shed that really does have that classic shed look to it. Some might even go as far to say that the shed has a somewhat rustic kind of charm to it. 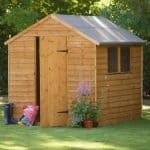 One of the things that is sure to surprise many people with this shed is that the size is actually far more generous than you would think. 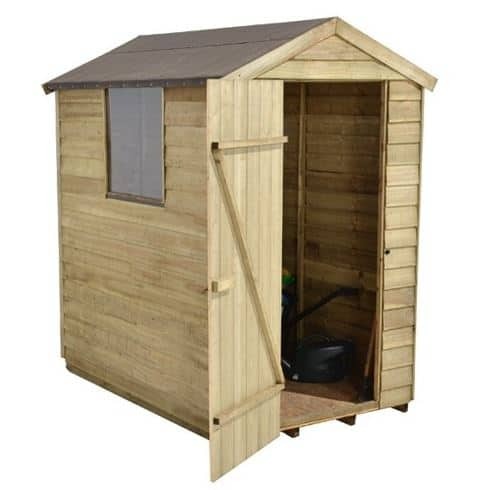 The depth is 6 feet and the width is 4 feet 3 inches so while not the largest shed on offer, we feel that this is still a good amount of space to make use of. Being inside the shed will not result in you having to hunch over so that you resemble a Hobbit as there is a fair amount of headroom inside the shed. On the top of the shed we have this very attractive apex roof which is made from solid sheet boarding and then covered with some green sand felt. The actual boards are very strong and even if we get many inches of snow and a whole bunch of the neighbourhood cats want to use your shed roof as their meeting spot, it can handle the weight. The felt covering the boards is able to stand up against rain, hail and anything else the weather dares to throw down on it. Those rustic looking walls are made with 8 mm thick overlap cladding that is joined together so well that rain cannot get inside the shed. They really have done an amazing job with this cladding and we are not just talking about how good it looks either. This is more than thick enough to take the kids kicking a ball off it, you throwing stuff inside it and even the weather giving it a real beating as well. Inside the shed they have used a thick and solid 28 mm x 28 mm frame that is well made so that the shed has a very robust design that will last for a long time. With a frame like this inside the shed, you will have no worries about the shed getting a bit flimsy as time goes by. The floor is one of the strongest and most impressive parts of the shed, so impressive that we are still scratching our heads trying to figure out how for this price they could have a floor like this. While the solid sheet boarding used for the floor boards may not be the most impressive kind of flooring out there the fact that they have used pressure treated floor joists really makes this one of the strongest floors we have seen on a sub £200 shed. Heavy things like a lawn mower, kids summer toys like a slide and heavy tools will be no problem for this floor. As we said earlier the wood does go through a pressure treatment process which makes it very strong and also far more resistant to rot. This takes away the need for annual treatment, but a coating every now and again is not going to hurt and if anything it will give you that piece of mind that your awesome looking shed is well protected from rot. The Hartwood 6′ x 4′ FSC Pressure Treated Overlap Apex Shed comes with a 15 year guarantee. A guarantee of this length shows just how much faith they have in their product. The door certainly has an eye catching look thanks to its vertical cladding and two large black hinges. This is a single door, but we feel that it is wide and high enough so that it can easily handle you getting larger items inside the shed. The door is also very well made in that there are those two large hinges and also the braces on the back of the door to make certain the door stays strong, even if you have kids who like to slam it after being told to put their toys away. There is one small window located on one side of the shed. This window is made from anti shatter polycarbonate so you have no worries about smashed glass being in or around the shed so if you do have a couple of kids running around the garden this is another thing that would make this a good shed for you. This window also will allow plenty of natural light into the shed, but as it is fixed it does not open which is a bit of a shame. 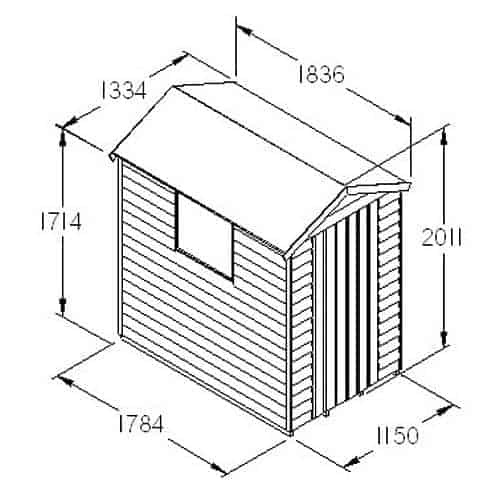 The shed is very well made and on the door there is a hasp and staple which will keep it tightly closed, but this does not actually lock the door so you will need to have a padlock or take a look at one of their security options if you do intend to keep expensive things in the shed. The window will let in natural light, but it is not so large that people walking past will be able to have a sneaky look and see what items you have inside. The shed we feel would look fantastic in many different colours so if you do want to flex those creative muscles then have a think about giving the shed a coating of paint. 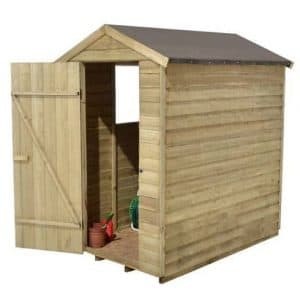 Also you do actually get wood treatment in a variety of colours these days so if you do want to really look after that wood then this would be one way to do that and also give the shed a different colour. We just talked about the lack of a lock, but they do offer two different locking options. First of all is a Yale branded hasp and padlock set that is available for £19.99. If you plan on keeping more expensive things like a mower or bike, then you may be interested in the shed alarm kit which adds an electronic alarm to your shed at a price of £29.99. If you are not too happy about the surface on which you will be installing the shed, then there is a plastic shed base available for £69.99. The shed is very well designed and the pressure treatment process that the wood goes through just makes it that extra bit high quality. You are going to be able to make use of this shed for many years thanks to the way it has been made. 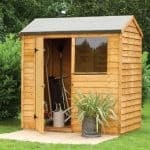 One of the best things about this shed is that it does not actually require a whole lot of care from your either. 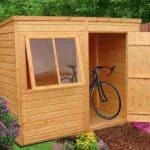 Certainly we have seen far larger sheds that this, but this is a decent sized shed that will give you that storage space you need and it can be maximized with some shelving and clever storage placement on your part. Get a friend with a decent tool box, good work ethic and who can also make a mean cup of tea and you will have this done in 4-6 relatively stress free hours. 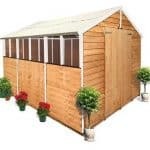 The pressure treatment process and the materials used make this a shed which we feel is very good value for money. 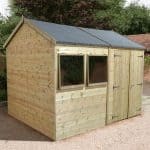 Final Thoughts: We will admit that the Hartwood 6' x 4' FSC Pressure Treated Overlap Apex Shed is not the most adventurous shed in the world, but this is still one very well made, long lasting and very well priced shed that impressed us greatly. The wood being pressure treated makes this a very low maintenance shed as well as being practically resistant to rot. 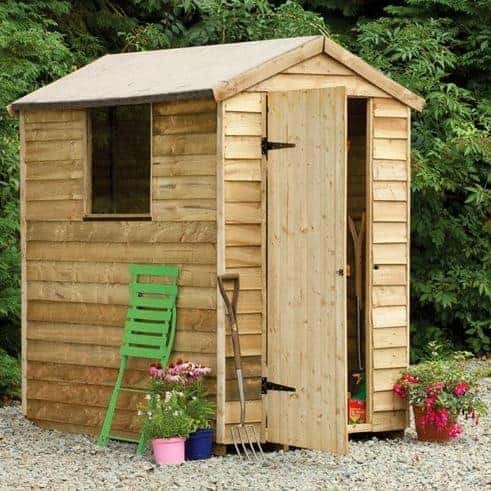 The size of the shed makes it ideal for gardens of all sizes as smaller gardens would be able to use this and even larger gardens that already have a shed would be able to comfortably handle this if you wanted a little extra storage space. We are very pleased with this shed and highly recommend it to you if you want a compact sized shed that has a lot of style.